Phil Jones' porcelain plates celebrate that quintessential bushy beard problem: getting stuff stuck in it. Is That a Corn Kernel? Is he more of a Civil War or a Santa Claus? Or more classic lumberjack? 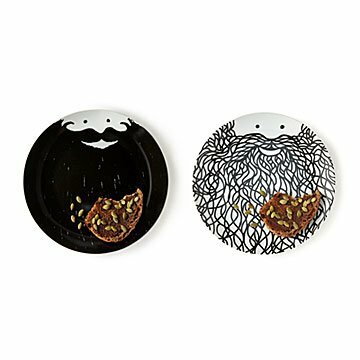 Whichever way those whiskers take shape, these playful porcelain plates celebrate that quintessential bushy beard problem: getting stuff stuck in it (sorry, just "saving it for later"). Give a set to the new grooms, or to the guy who likes his facial hair like he likes his dinner plate: full. Illustrated by Phil Jones in Minneapolis. The plates are nice and came in a nice box. The art is great. Loved how unique and personalized this gift was!